That rugged appearance at an economical price! 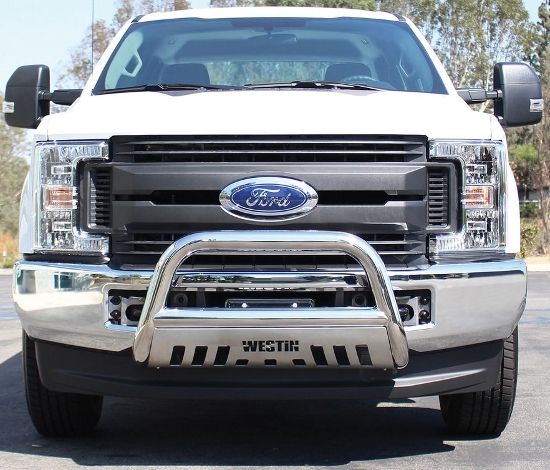 The E-Series version of Westins Bull Bar is perfect for seekers of a rough and tough look. A polished stainless steel shine and a classic skid plate design are essential E-Series elements. Install Westin Driving Lights on mounting points along the center bar for maximized use and function. Ensure your vehicle with the protection of an E-Series Bull Bar. The right look at the right price and it comes with a Lifetime Warranty. The right decision. There are no excuses! *Your state may require you to display a front license plate. If required, order License Re-locator P/N# 32-0055. For use with Ultimate and E-Series Bull Bars.